This weekend we hit up the JK present schooling show at the horsepark for some ticketed rounds and dressage practice. This show was originally supposed to be held the previous weekend, but was moved due to rain. The date change messed up our dressage entries, but I’ll cover that in my dressage post. 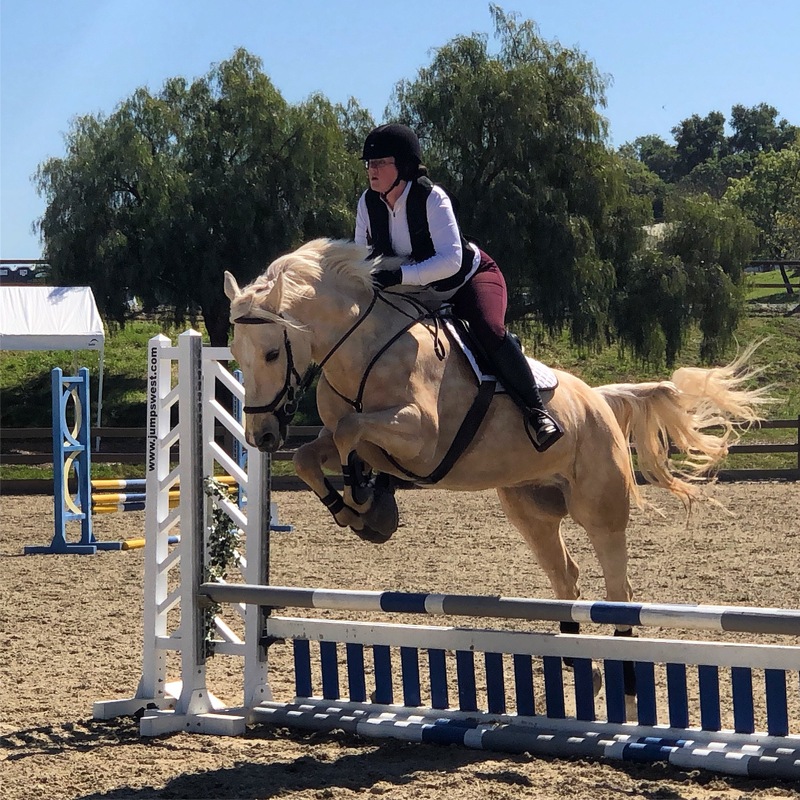 The show runs like a normal schooling show on Sunday, but on Saturday, they do ticketed rounds for the jumping classes. You buy tickets and turn them in at the arena you want to show in whenever it gets to the height you want to practice. 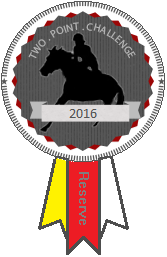 You can do as many rounds as you have tickets for and you get a blue clear round ribbon if you go clear. We like the ticketed rounds because we don’t really care about placing and its cheaper. 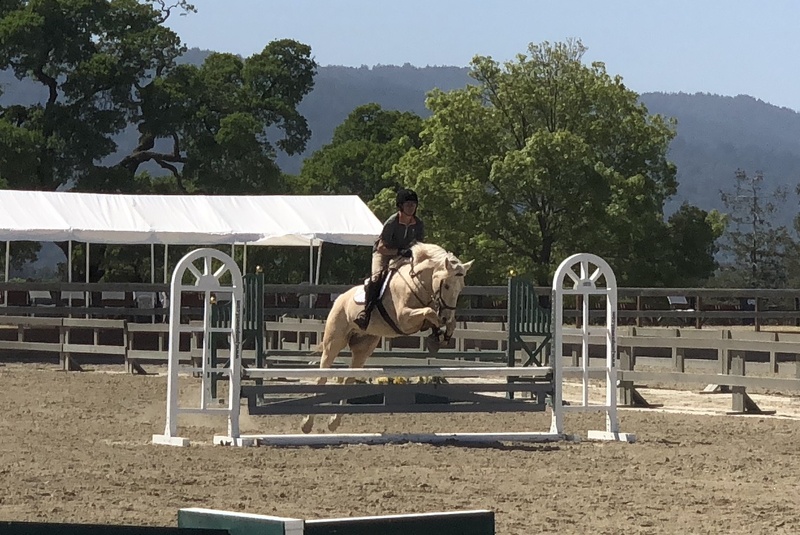 Dressage wasn’t until 12:30 so we started off the day with some jumping. I had two tickets for Levi with the thought of doing a round at .70-.75m to warm up and then doing the .8-.85m. 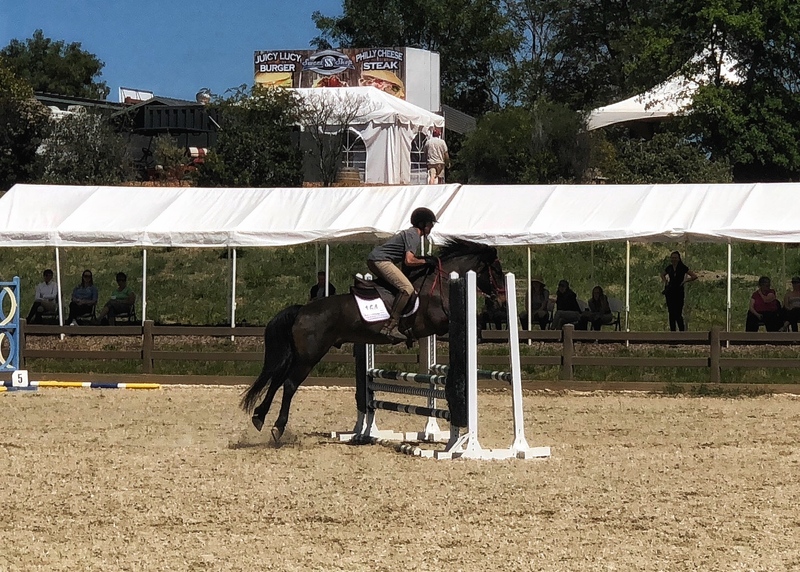 Levi warmed up pretty well despite the hectic and super tiny arm up arena and then we went in for our first round. He squirreled hard to the first jump, then harder to the second before slamming on the brakes at the last moment. One of the things that really frustrates me about riding him is feeling like I have no control. I could feel him backing off from strides out. I tried keeping leg on and nothing. I even tried smacking him with the crop and nothing. 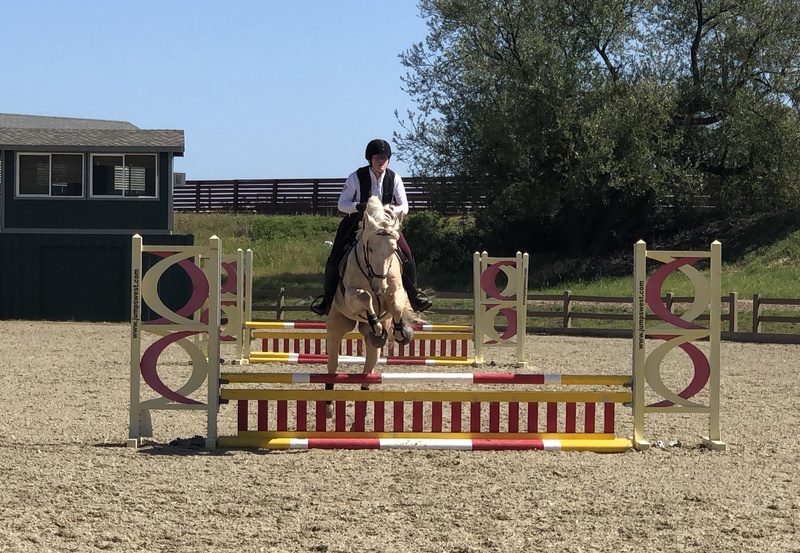 We re-approached and he decided it would be better to go over the jump than dealing with me again. We got around the rest of the course clean, but it was not pretty. Everything was wiggle, wiggle, wiggle, dramatic overjump. I decided to use my second ticket for another round at that same height. That round was much better. He was confident, forward, and flying over the jumps. Unfortunately, we don’t get 2 rounds in eventing. I just don’t know how to get that second round horse the first time out. Despite that bauble, they cleared all the jumps. Eugene as come so far in the last year. He really looks like he knows what he’s doing in the jumper ring. He’s even taking longer spots. My husband had three tickets. He had put himself in the order of go for two rounds at .8-.85m, but decided to scratch the second round and keep both remaining tickets for the .9-.95m. We took a break from jumping to do our training 1 tests and then my husband returned to the jumper arena to try the .9-.95m course. Some of the jumps were at the .9m (about 2’11”), but about half were at .95m (3’1″). Eugene’s done some jumps at home at 3′, but never a full course. However, before they could face the challenge of showing, they had to survive the warm up ring. Now, we go to a lot of schooling shows and I’ve seen my share of crazy, but this warm up was it’s own special hell. It was super tiny – no bigger than a small court dressage arena with 2 jumps in it and like 12 people schooling. One trainer was setting out poles strides out from the one jump to school her client. Another seemed particularly bent on being run over. 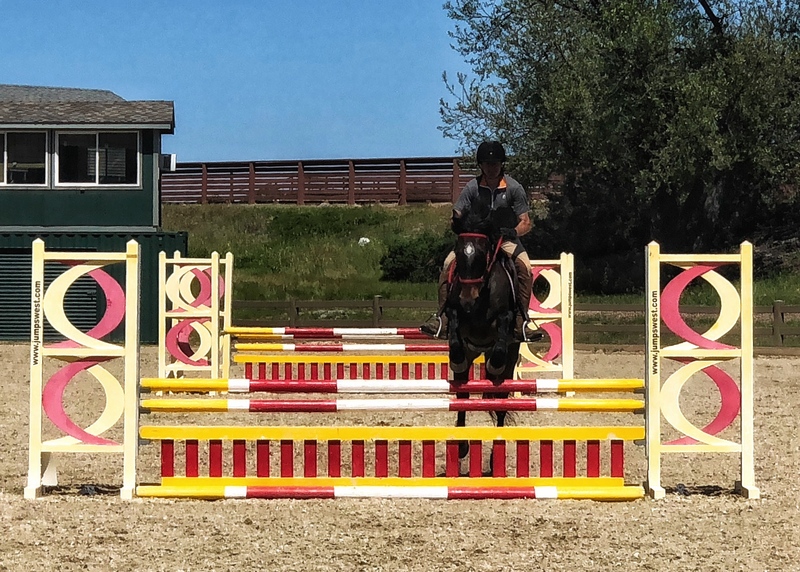 As my husband was heading to the one jump – after calling very loudly that he was doing it, she stepped into it and starting making it into an oxer. (It actually had been an oxer earlier in the day and we appreciated it being changed back but maybe not right that second.) My husband peeled off at the last moment to avoid hitting her and the other trainer started yelling at him about safety first. Umm, yeah I think the lecture should be directed elsewhere. I watched her almost get run down by another rider a few minutes later when she decided to walk across the jump again while someone was coming to it. 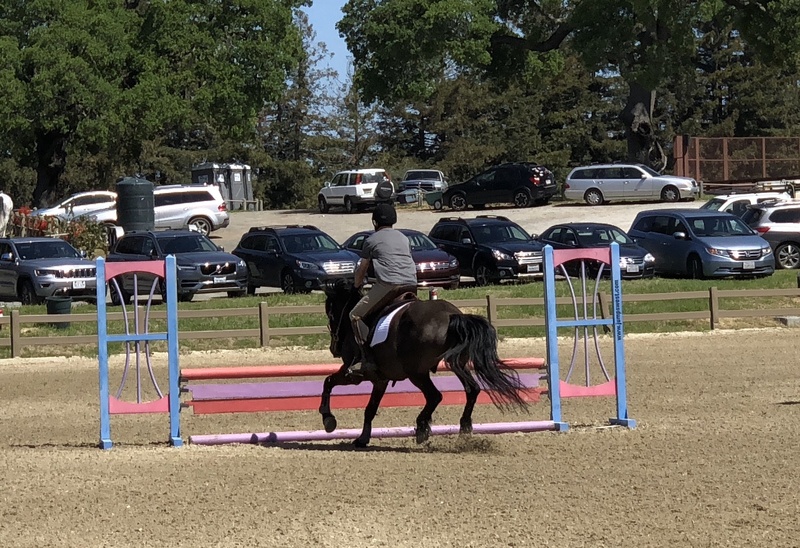 There was a rider standing by me outside of the warm up and she was making a plan to enter the ring, ride over the vertical, and then ride straight out of the other end of the arena and be done. I told her to go for it. After my husband got cut off by someone who decided to circle directly in front of the jump after he yelled that he was doing it, I told him to just leave. It’s not worth it. Eugene went into the ring and just owned it. He was really flying around and attacking those jumps. He was a bit wiggly into #2 and they landed awkwardly. My husband just slipped the reins and let him recover. Then pointed him at #3 and Eugene did it even though the reins were flopping around. Levi would have pieced right out about that, but Eugene will do whatever my husband asks him to do. He had a tap on the rail with his back foot at #5, but it stayed up. After #5, it was smooth sailing. The line from #6 to #7 rode really well all day and this round was no exception. Eugene looked great over those two jumps. It was such a great round. Even a few of the trainers watching complimented my husband on Eugene afterwards. He is such a game little horse. He did so well, my husband decided to end on a good note and let him be done with that round. That left my husband with an extra ticket. I didn’t want to do another round, so my husband decided to ride Levi for the last ticket. 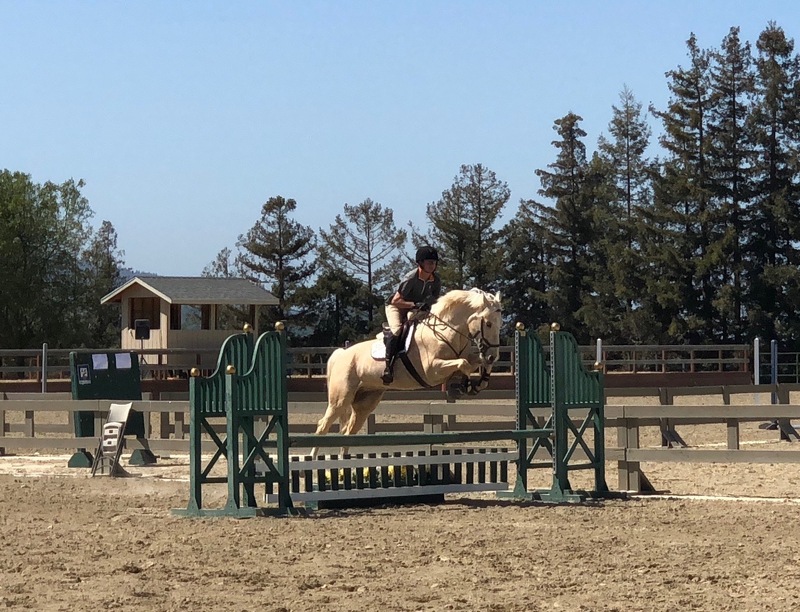 The hunter ring was doing 2’9″ by then, but in hunter land that meant actually 2’6″ so we tacked Levi up and went over to that ring for some practice. This warm up was also hectic since some trainers were changing the jumps and having their students do weird things. Luckily, there weren’t 12 people trying to fit into the ring so it was less crowded than the jumper warm up. My husband popped Levi over a warm up jump and then got out of there. Then he took a hard look at #2 and skidded down to it. My husband spurred him on and he took down the rail but didn’t refuse. 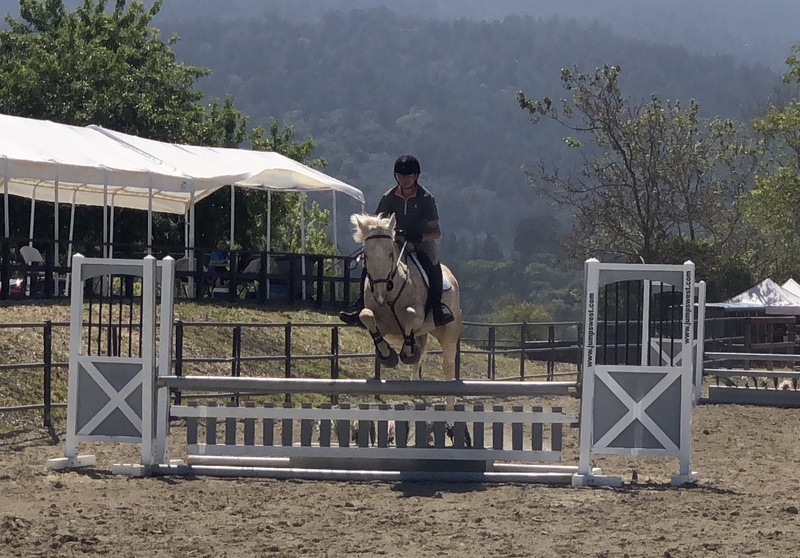 He was a bit wiggly to some of the other jumps, but no other rails or refusals. My husband said whenever he backed off a bit, he’d just add some spur and push him forward. He made a good point that the spurs let him push Levi forward equally whereas the crop he likes to evade by going sideways. Of course, he’s never been ridden in spurs before so he was probably rather surprised by that. Kate has recommended riding him in spurs before and I’ve resisted but I think I’ll try them and see if it helps. It was good to have my husband ride Levi for a round. He’s got a lot more patience than I do and handles his goofiness better. His opinion was that Levi is super excited about jumping, but doesn’t really know what he’s supposed to do with his body and then gets scared about the actual jump. My husband doesn’t get bothered by any of that and just spurs him on and gets him over it. Overall, it was a great show: the rings rang pretty close to on time, the weather was perfect, the ponies did really well, and we had fun. Stay tuned for a post on our dressage adventures. That warm up…ugh. I was helping in the warm up ring at The Fork earlier this month. The warm up was just as bad. 3 jumps in a tiny little warm up ring for the 2* crammed full of high end horses trying to get ready for their round. It was a mess and there were a ton of very angry riders. Levi looks good as does Eugene! This was the tiniest warm up I’ve ever seen and it was so crowded. 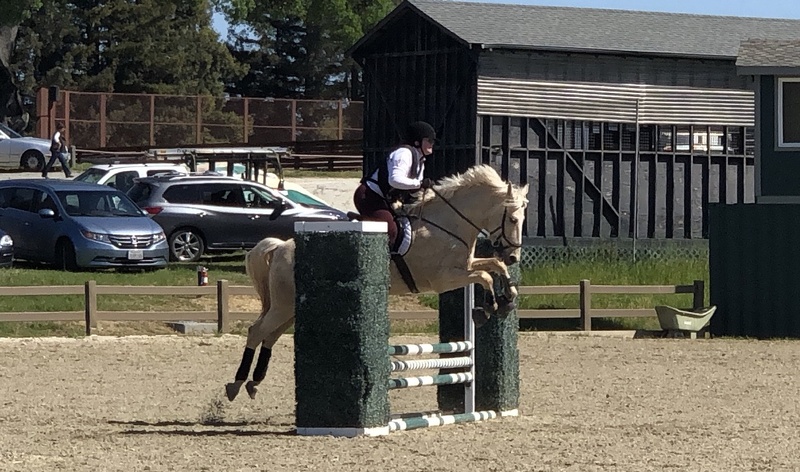 We’ve been in some hectic warmups, but at least at real events trainers aren’t out there rearranging the jumps at their desire. I know it is not helpful, but maybe Levi just needs miles. This is what one of mine did for a while until it just seemed to click. 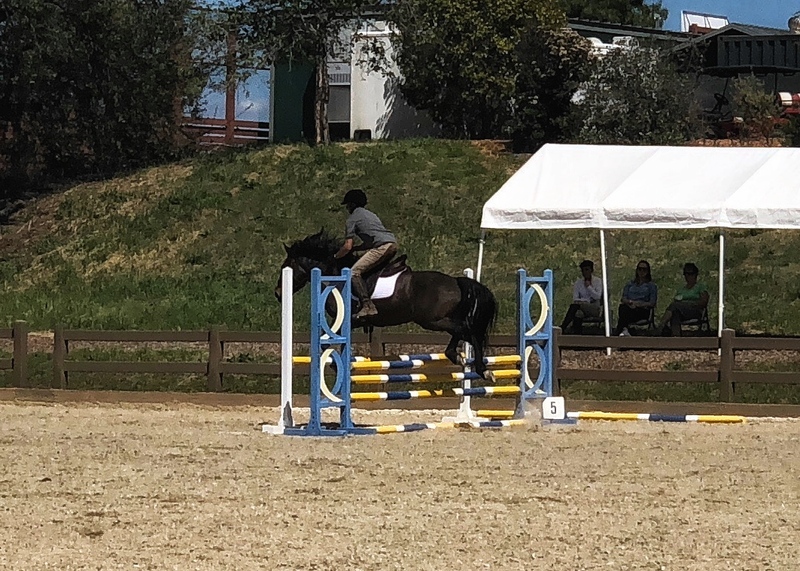 I kept our show jumping small (because that is where I am less brave) so I could keep riding him forward to every jump. Denny Emerson’s posts of ‘building bravery’ really resonated with me. He says you build bravery in a horse by manufacturing success. Keep everything really easy until they are bored. I jumped like 2 foot because that is where I knew I could make it good every time. 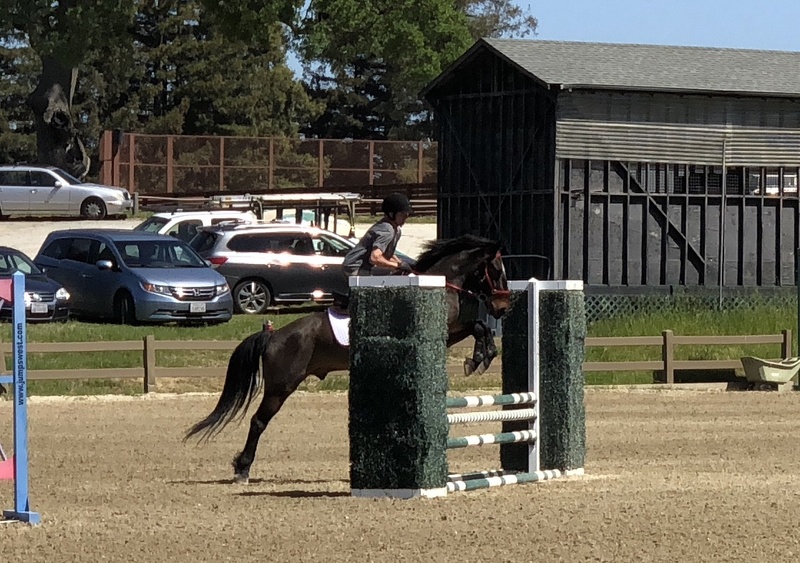 Now he is a jump seeking missile (I still keep the jumps around 2’6″ because I am weenie). I know this may not be helpful, just wanted to share that I have been there. That’s what my husband keeps telling me. And I think it’s probably true. My frustration is that he’s been doing this for a year now. In my mind this is not a new activity for him. But in his mind it’s still new and hard. I think he probably needs a ride who is more patient than I am. Ugh, those warmups sound horrifying! Sorry Levi was such a dufus to start out. Jamp is the same way. Has to do a warmup. He will scoot and run off EVERY HORSE SHOW in the first class. Doesn’t matter who’s on him. Then he’s wonderful. So very strange. I would definitely try the spurs! He looks fantastic jumping the bigger jumps! Sounds similar. 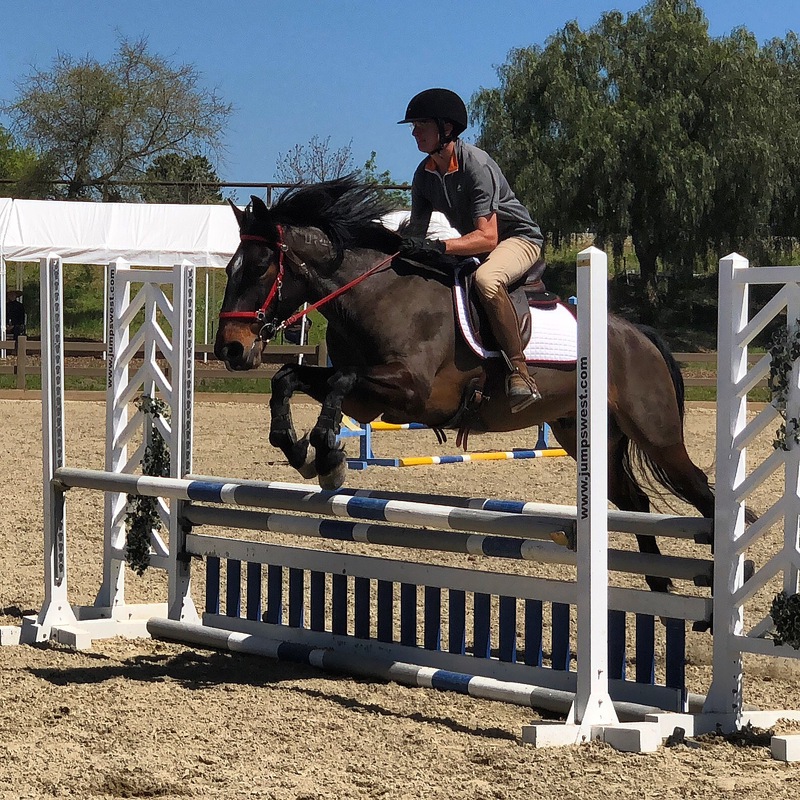 There’s just no warmup round in eventing. Levi needs to learn how to get his head in the game. great job. How bout making your husband ride Levi and you ride Eugene? HA Damn if Levi doesnt look good when he is jumping. And Eugene just continues to improve. Really wonderful photos. My husband suggested that, but I find Eugene to be VERY difficult to ride. He’s not bad for me – he’s still a good boy – but he’s very uncomfortable to me and doesn’t make me feel confident the way he does for my husband. OMG that warm up. Yuck yuck yuck! And really neat to see your husband on Levi! It’s so cool you were able to get his feedback on his jumping behavior from him. And curious about the spurs. I hope that will be the missing piece y’all need this summer! My husband really likes riding Levi and he’s more patient with him than I am as well. I thought about going to the show, but decided to go on a trail ride instead, lol. After hearing about the warm up ring I’m kind of glad with that decision! The dressage warm up was crazy too. The warm up rings have never been this small before. They rearranged the arenas and it was not to good effect. With as many rings as they have, you think they could figure something out! It’s never been a problem before so I hope they go back to the old set up.